Gemini March 2016 Horoscope predicts that professional matters will be important as majority of the planets are in the Northern half of your astrology chart. Domestic issues will require your consideration due to the influence of lunar eclipse of 14th March. Gemini, your independence and outer objectives will rule during March 2016. You have to decide on your life path and follow it up with hard work. There is no need to be flexible as you can have your way in attaining your targets. The Gemini sun sign will have to move swiftly with all the confidence they have in order to be successful. The March 2016 Gemini monthly forecasts suggest that planetary positions are auspicious for introducing new products or initiating new ventures. You will be able to complete your business projects successfully during the month. You will get new job offers during the end of the month but they require proper scrutiny. The 2016 astrology predictions also foretell that your earnings will be strong during the first two weeks of the month as well as during the last week of the month. Your financial strategies can be modified during the last week if required. Geminis may get unanticipated cash flow during the month. You will have the full assistance from your spouse on monetary projects. Improving their social circle will be more interesting than love relationships during March 2016 for the Twins. You can expect more progress in matters of love after 20th of the month. Love for Gemini is hampered by work related stress. Time is not propitious for taking important decisions such as marriage, divorce or pregnancy. The 2016 March Gemini horoscope also predicts that you may have to devote your time to repairs of residence or for relocating to another place. Family environment may be difficult and you have to strain yourself to improve the relationships. Friendships for the Geminis will be under strain due to the Eclipse and they may be undergoing major changes. Social organizations you are supporting will face major transformations. Singles will have to be patient while forming new relationships. Here are few tips to impress your date. Health will be fragile for the Gemini zodiac sign till 20th March 2016. You have to conserve your energies till that time. Improvement in fitness will be evident after that with proper physical exercises like yoga, walking and swimming. 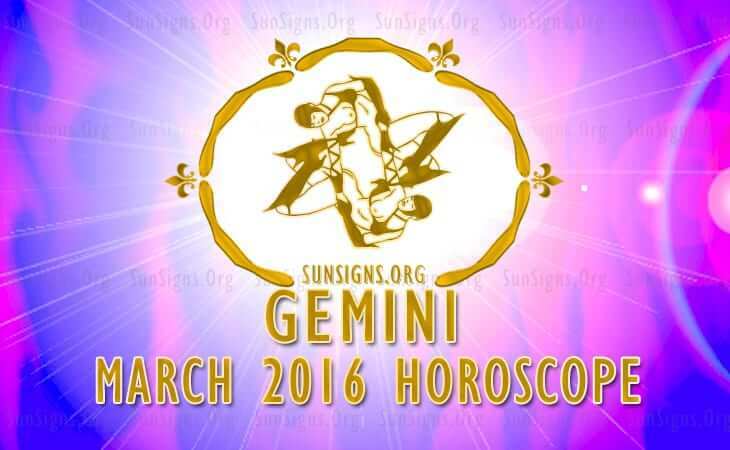 To conclude, March 2016 is a month filled with hectic work both on personal and professional front for the Gemini.